Forget all that couch-hopping nonsense. 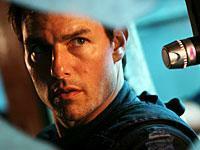 When it comes to high-definition, Tom Cruise is still the king, snagging the top-selling next-gen title of 2006 according to Paramount Home Entertainment. Unfortunately, Paramount's boast today that 'M:i:III' is the top-selling high-definition packaged media title of 2006 comes with no hard sales figures. Nor does it include info on which format moved more copies. The claim is also apparently entirely studio-generated, so forgive us if we take the news with a grain of salt. Still, there is no doubt that Mission: TomKat was a big success on high-definition, and anytime a next-gen title generates such interest and media buzz, we're all for it. Hopefully someday soon VideoScan, which is currently the leading independent industry firm for tracking point-of-sales data, will begin to release some concrete stats on Blu-ray and HD DVD software. Until then, we'll raise our glass and toast Mr. Cruise.